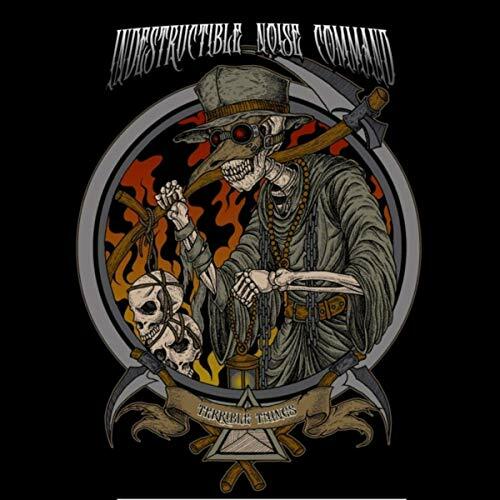 I remember INDESTRUCTIBLE NOISE COMMAND from the tail end of the 80’s, when they part of the huge thrash metal boom at that time. I can’t say they made a huge impression on me, as they seemed to be decidedly second-tier and not on the same level as the big boys. More than 30 years later and INC are still in action. Terrible Things gives the listener a fuzzy glow of thrash nostalgia as the band is still plying thrash in the time-honored tradition. The production here is a level above their old stuff (which I remember having a horrendous sound) and that approach is resolutely American thrash metal in the tradition of ANTHRAX, NUCLEAR ASSAULT and TESTAMENT. Chugging and choppy thrash riffs varying from mosh tempo to flat out speed, mixed with some melodic guitar work. Once in a while, there is just a vague hint of more modern metal, but not much. The vocals come across as a raspier version of TESTAMENT’s Chuck Billy. In 2019, INC is not going to suddenly ascend to the top of the metal ladder and I’m sure they know it. Therefore, just plug in and thrash out, which is what we get on Terrible Things. The album picks up force as it goes along and many of the best tunes like ‘Unscathed’, ‘Nemesis’ and ‘Devil Of Hearts’ are found on the back end. These will bring a smile to any fan of ANTHRAX or NUCLEAR ASSAULT.